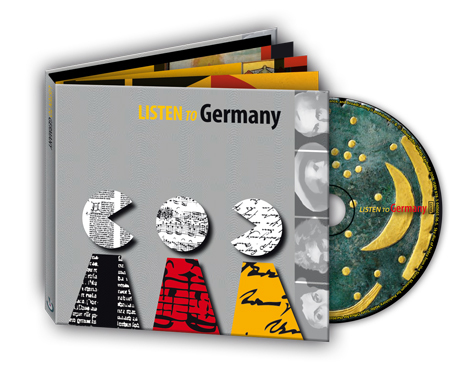 A musically-illustrated journey through Germany’s cultural history from its beginnings to the present day with numerous musical passages, artistic booklet, time line and colorful illustrations. Really, there’s no such thing as “the Germans.” The independent regions in central Europe took a long time to come together. “Two souls, alas, are dwelling in my breast,” sighed the torn national ’hero’, Faust, immoral and at the same time, thirsty for knowledge. This split self-consciousness accompanies German history, both in its productivity and its destructiveness. But it’s precisely out of these contrasts that artists developed their ideas. In her musically illustrated journey of sound, ARD cultural journalist Corinna Hesse uses information, original texts and music from two millenia to create a complete picture out of pieces in a mosaic. The CD tells how Luther and Kant revolutionised thought and beliefs. Bach, Beethoven and Wagner in uenced musical history in Europe just as Albrecht Dürer, Caspar David Friedrich or the Weimar Bauhaus in uenced art, architecture and the sphere in which we live. In the “zero hour” following World War II, input from writers and artists sparked a critical debate with contemporary history – and aided the discovery of identity in a divided and then reunited Germany. With profundity and irony, artists today still respect the Germans’ search for cultural identity in a pluralistic society.